The checkweighing scale is suitable for checking and controlling weights. In combination with software packages and measurement accuracy up to 0.01 mg, the checkweighing scale is a useful device for a lot of applications in the private and professional sector. Whether it is the weight control of ingredients, whilst baking in your kitchen, the verification of weights in laboratories and workshops or the control of industrial production processes, the checkweighing scale can be used nearly everywhere. In comparison to other scales, the checkweighing scale comes with another range of functions and a different designation. Especially in industry, the checkweighing scale plays an important role. It can be found in arrivals, where received goods have to be controlled (also known as range scale, hanging scale, etc. ), in production processes, for monitoring mixture ratios, or in control procedures of end products. The checkweighing scale is also useful in goods issues for controlling the delivery charges to guarantee safe shipping conditions. Each checkweighing scale can be equipped with special features like limit weighing, analogue outputs, switch contacts, etc. Besides, you can choose between a gauged and a not gauged checkweighing scale. PCE-PCS 30 is a checkweighing scale or balance with accurate weighing and piece or part counting functions. Ideal for use in laboratory, office, inventory and industrial applications, this portable scale can be powered by battery or by the included electric power supply. The scale's built-in RS-232 port enables data transfer and printing. PCE-PCS 6 is a checkweighing scale or balance with accurate weighing and piece or part counting functions. Ideal for use in laboratory, office, inventory and miscellaneous industrial applications, this portable scale can be powered by battery or by the included electric power supply. The scale's built-in RS-232 port enables data transfer and printing. Affordable Checkweighing Scale. It can be calibrated with (200 g), weighing units can also be selected, with piece counting function. Checkweighing Scale. It can be calibrated (2000 g), weighing units can also be selected, with piece counting function. 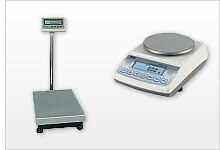 Checkweighing Scale with 3 ranges, weight range up to 1,500 kg. Checkweighing Scale with high resolution (0.0001 g), RS-232-interface and optional software-kit / with weighing ranges of 0 ... 100 g.
Checkweighing Scale with high resolution (0.0001 g), RS-232 interface. Robust and extremely affordable platform scale with EC-Type Approval [M]. Verification as an additional option! The industrial scale for professionals. Robust laboratory and industrial scales with graphics display. Top of the range cost-effectiveness, with EC-Type Approval [M].